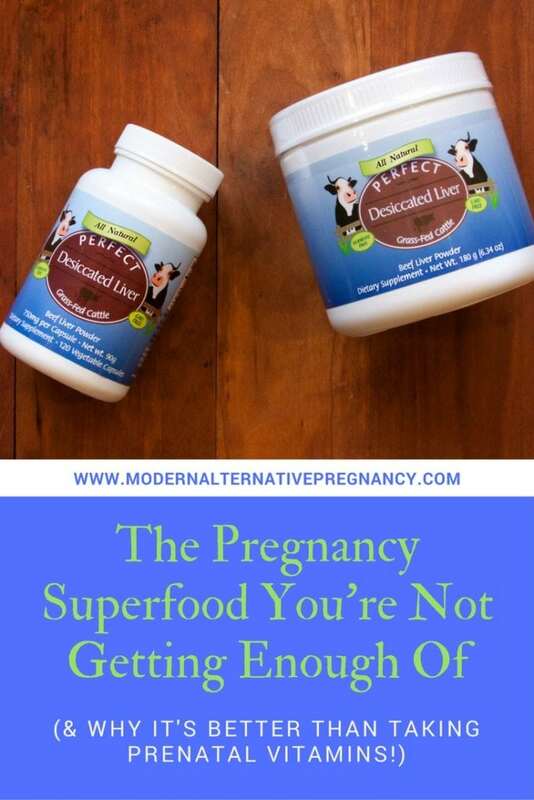 If you’re familiar with the Modern Alternative Mama way of life, you know that we’re not big fans of multivitamins, not even when it comes to pregnancy and prenatal vitamins. We do, however, love a good supplement that provides the nutrients needed for a growing baby and mama, all in a food-based, bioavailable form. That’s why contributor Jaclyn is sharing the benefits of Perfect Desiccated Liver. This post is sponsored by Perfect Supplements, but all opinions are my own. Should You Take a Prenatal Vitamin During Pregnancy? While this is a personal question – and one every woman must answer for herself based on her needs – I personally haven’t used a prenatal vitamin in my last two pregnancies. Instead, I’ve focused on food-based supplements that help to provide extra nutrients for my growing babies. Your doctor or midwife may prescribe a prenatal vitamin. (I was prescribed giant, pink pills during my first pregnancy, which made me so nauseated that an acquaintance even commented that I looked green soon after taking one!) Or maybe your provider suggests picking one up from the store. However, prescription and over the counter prenatal vitamins may not be the best choice. Folic acid. This synthetic form of a needed B vitamin may be difficult for some women to assimilate and may even result in toxicity, particularly for women with MTHFR genetic mutations. Iron. Also carrying the possibility of toxicity due to excess iron the body can’t use, prenatal vitamins typically contain a lab-created iron that is likely to cause constipation. Vitamin A (beta carotene). Also a synthetic form of an important nutrient, this fake vitamin can interfere with vitamin A receptors in the body and lead to a deficiency. Artificial coloring. ‘Nuff said. Just why? With all these questionable ingredients, one might wonder why we would insist pregnant women take prenatal vitamins. Do they even help at all? Yes and no. While we have seen a decrease in neural tube defects since medicating pregnant women in the U.S. with folic acid, we are also seeing an ever-increasing sicker population of mothers and children. I myself suffered severe pre-eclampsia during my first pregnancy, despite religiously taking prenatal vitamins. I lived on a diet of processed food: take out, candy bars, and chips were my staples. All the health professionals I saw assured me my diet was adequate to nourish my growing baby. Even more interesting, in many other countries, women are not routinely given prenatal vitamins, and have better health outcomes for pregnant mothers and their babies. In contrast, the U.S. has some of the highest infant and mother mortality rates in the developed world. So, why the disparity? Do women in other countries know something that women in the U.S. do not? And is there a better way to get the nutrients a pregnant mama needs without resorting to synthetic, possibly toxic ingredients? Maybe it’s becasue the diet of women in some other countries is much healthier than the standard American diet. Since mid-century, Americans have abandoned traditional diet staples like saturated fats, whole, unadulterated grains, and organ meats. As a Modern Alternative Mama, you probably already know you should eat good fats like butter, coconut oil, and lard. You might already avoid refined white flour in favor of healthier whole grains. But organ meats? I know that’s a stretch for some of us. I’ve spent years trying to sneak liver into my family’s diet, and while it can be done (I’m rather proud of this not-so-secret ingredient chili! ), I’ve found it’s about a million times easier to simply supplement this nutrient. Taking a few capsules every day is much easier than trying to mask the rich, iron-y taste of liver – particularly if you have a sensitive pregnancy palate. Can’t stomach liver? Perfect Desiccated Liver to the rescue! Remember the synthetic vitamins I told you were in most prenatal vitamins? Those same nutrients can be found in their natural, bioavailable forms in a single food. That’s right, liver! And since Perfect Supplements offers convenient capsule and powder forms, it’s easier than ever for you to eat liver every day. is nature’s most potent source of vitamin A.
contains all the B vitamins in abundance, particularly vitamin B12. is one of the best sources of folate, a needed pregnancy nutrient. contains a highly usable form of iron. is a good source of trace elements such as copper, zinc and chromium (liver is our best source of copper! ), and CoQ10, a nutrient that is especially important for cardio-vascular function. is a good source of purines, nitrogen-containing compounds that serve as precursors for DNA and RNA. Do I have you convinced to toss your toxic prenatal in favor of whole-food desiccated liver? It’s important to note that I can’t recommend just any liver supplement. You’ll find all kinds out there online, but there are a few reasons I recommend Perfect Supplements Desiccated Liver above any other brand. It is non-defatted (I’ve heard reports of the defatted kind causing “jitters” and other unfavorable side effects). Perfect Supplements Desiccated Liver is grass-fed on green grass untouched by pesticides or toxic fertilizers. Thi is super important to ensure those nutrients are present in abundance! It contains no added ingredients or fillers. It is more affordable. Perfect Supplements is super conscious about providing top-quality supplements as affordable prices, and even offers multi-item discounts. Not only does Perfect Supplements offer the convenience of encapsulated liver, which gives you all of the above nutrients in just four capsules a day (pop all four first thing in the morning and you’re done), but they’ve also recently released a powdered form which allows you to add the liver to anything you like. This new loose powder can be added to soups, smoothies, or whatever you’d like. I’ve even added it to chocolate avocado pudding without my kids noticing! P.S. Want a recipe to help balance and nourish your hormones during pregnancy? Check out this DIY hormone supplement using Perfect Supplements’ hydrolyzed collagen and fermented kale powder. 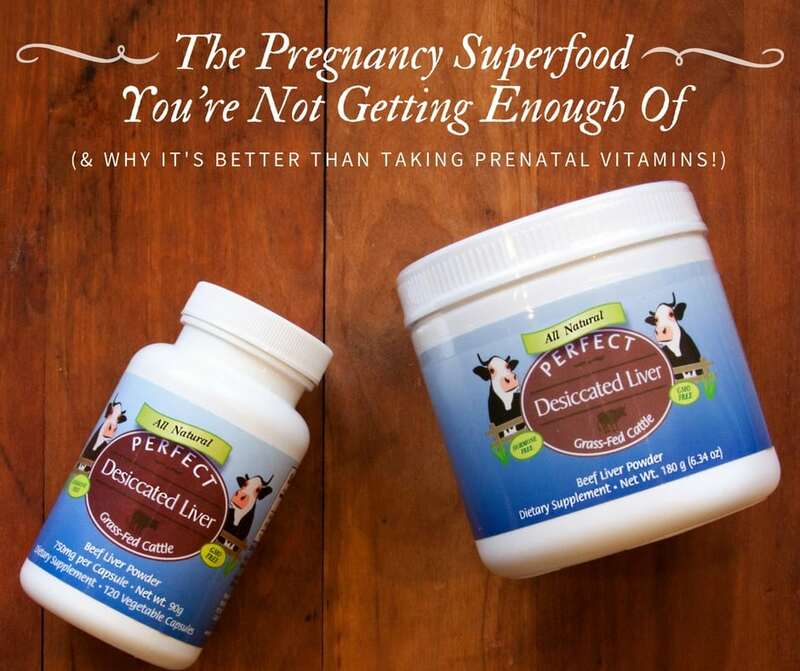 Have you ever skipped traditional prenatal vitamins an instead opted for a whole foods approach? What was your regimen? Just to be clear, are you saying that I can replace my prenatal vitamin by taking the recommended dose of dedicated liver? If I take 4 capsules of the desiccated liver every day, am I not getting too much vitamin A? I have heard you should only eat liver 2 times a week if you are pregnant? I am currently 30 weeks pregnant and am not taking a prenatal. At my 28 week appointment they drew labs and I’m anemic. I have mthfr so I’m on methylfolate, methyl b12, NAC, same, d3, phosphatidyl serine, pro DHA, zinc, vitamin c, probiotic. I am thinking of doing the desiccated liver for my iron. Do you know if I need to monitor my b12 and folate since it seems to improve them also? I put organic grass fed beef liver (frozen 14 days) in a smoothie..raw. It makes me sleep better, too! 34 weeks pregnant here.